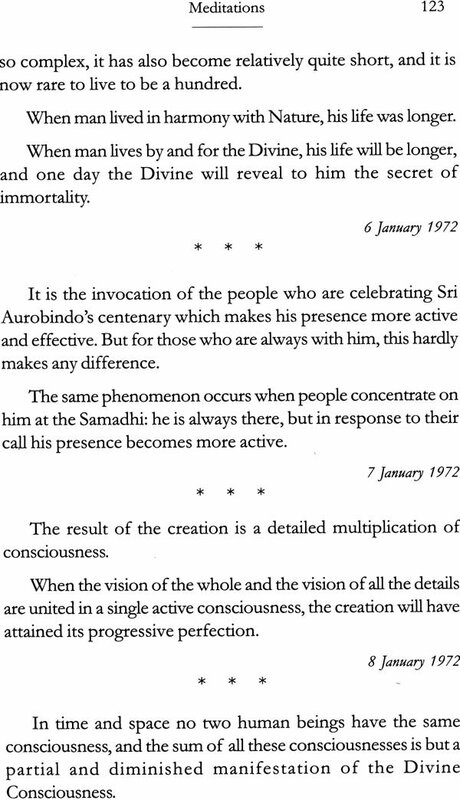 Sri Aurobindo was actually trying to compose a poem in a quantitative metre when 'Rose of God' burst forth, each of its lines containing six stresses. Like the Vedic mantra, this became a prayer for the blossoming of the Divine Rose on earth, its five petals blazoning Bliss, Light, Power, Life and Love. This was on thirty-first December, 1934. From the first of January 1935 the prayer must have begun to act. Even as the forces of Evil set up the Second World War, the roses of God bloomed defying Darkness and soon some of them had been drawn to Pondicherry for Divine nurturing by the Mother. Tara happens to be one of them. To have been in day-to-day contact with the Mother as willing clay to be moulded into a flaming warrior of the Omnipotent could not have been easy for a girl-child. How did Tara manage? 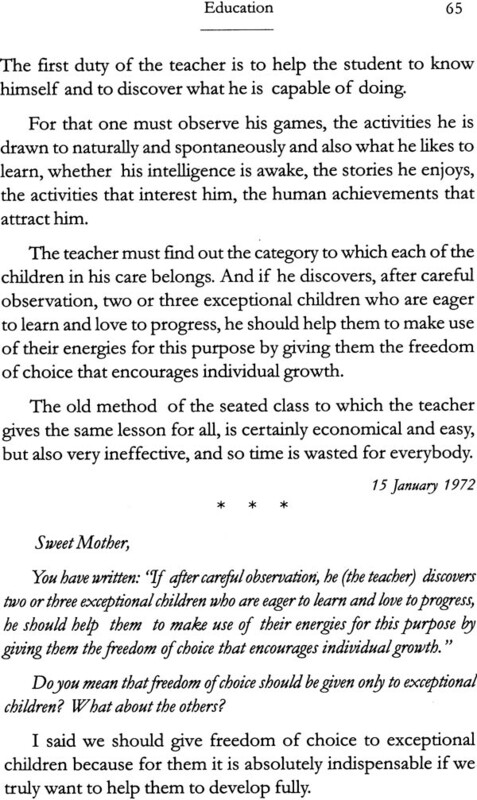 What was the methodology of the Mother in educating a child? Reading this book gave me quite a few existential shocks. 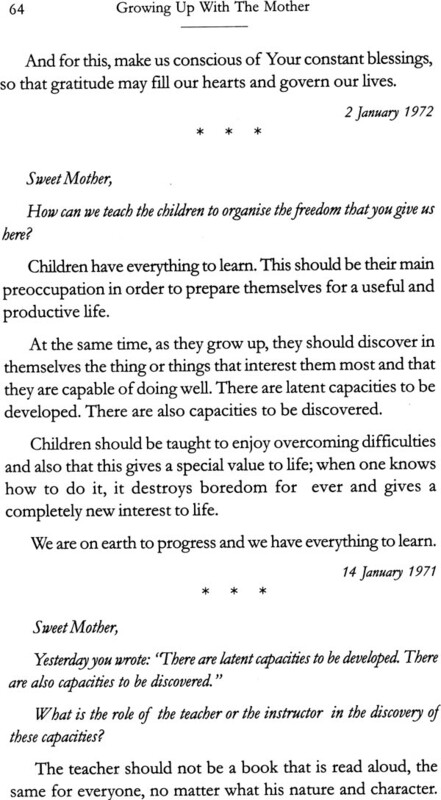 For forty years I have known Chachaji's family and during all these decades I have been quoting the Mother's answers to questions on flowers, on the ideal of woman's beauty, on women and physical exercises, on education and on yoga. But I never knew Tara was the questioner! Sri Aurobindo himself would have enjoyed the humour of this situation. In a sense, then, a good deal of this book will be familiar to the readers also. And yet, we will be coming to it again and again because the golden thread of connection with Tara makes the message a special guide for teachers online. 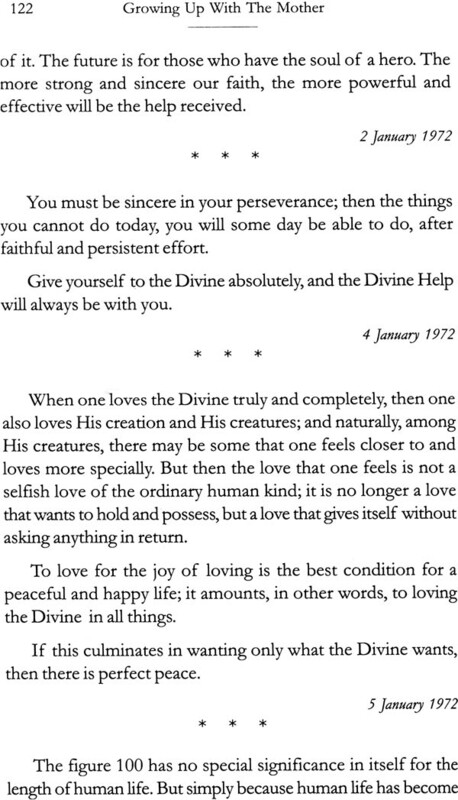 Take the word that is the very basis of this divine living: sadhana. How does the Mother manage when a twenty-three year old young lady asks seriously: "Sweet Mother, What exactly are the subconscient and the inconscient?" But there is no hemming and hawing. The answer comes clear, direct and with full faith in the listener's sincerity. "The inconscient is that part of Nature which is so obscure and asleep that it seems to be wholly devoid of consciousness; at any rate, as in the stone, the mineral kingdom, the consciousness there is entirely inactive and hidden. The history of the earth begins with this in conscience. ''We too carry it in ourselves, in the substance of our body, since the substance of our body is the same as that of the earth. "But by evolution, this sleeping and hidden consciousness gradually awakens through the vegetal and animal kingdoms, and in them subconscience begins; this subconscience, with the appearance of mind in man, culminates in consciousness. This consciousness likewise is progressive, and as man evolves, it will change into superconscience. ''We too, then, carry in ourselves the subconscience which links us to the animal, and the superconscience which is our hope and assurance of future realisation." The Mother was a rare teacher; a teacher who wanted questions to be asked! She would be upset if students remained dumb as if the lesson had just flown away with the wind. Tara asks a variety of questions: how to teach, how to manage exceptional children, the nagging worries a woman has about her body, the strength needed to come to terms with the physical loss of a dear one. The answers are dipped in the molten gold of Truth and hence one finds a rapier-sharpness in the replies conveying a message never to be forgotten. Here is a request whether some relations could come over to Pondicherry as the conflict with Pakistan makes Delhi somewhat unsafe. The Mother's reply: ''They can come to Pondicherry-but those who are afraid, are afraid everywhere. And one who has faith is safe wherever he may be." "I am always with you and will be with you throughout your journey to help you to find the Divine-the only way to have lasting happiness. "I expects to see you again on your next birthday; pray for this grace which is the true aim of your life. "I ask only that you have faith and trust. 1 am curling myself up in your heart so that you will always find me there. The Mother is also the Universal Mother. Hence the messages addressed to Tara become messages for all of us, even if they are interactions at a very close personal level (the Mother on how She divides the photographs given by Tara, on the continuation of a medical treatment); a casual sketch of Tarini by the Mother is revealed as a silent message on how to meditate; and the information about Tara's indexing 10,000 photographs of the Mother moves us to meditate on the Maha Meru Yantra. 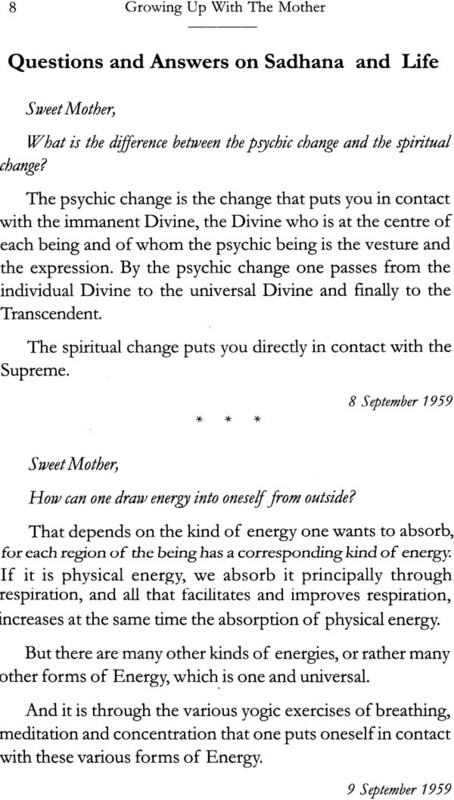 For who can exhaust the facets of the Divine Mother? That is why Tara reveals only lightning flashes of those days in Pondicherry when it was as if gods walked on earth while the Supreme kept busy fashioning the Next Future. And how was it done? 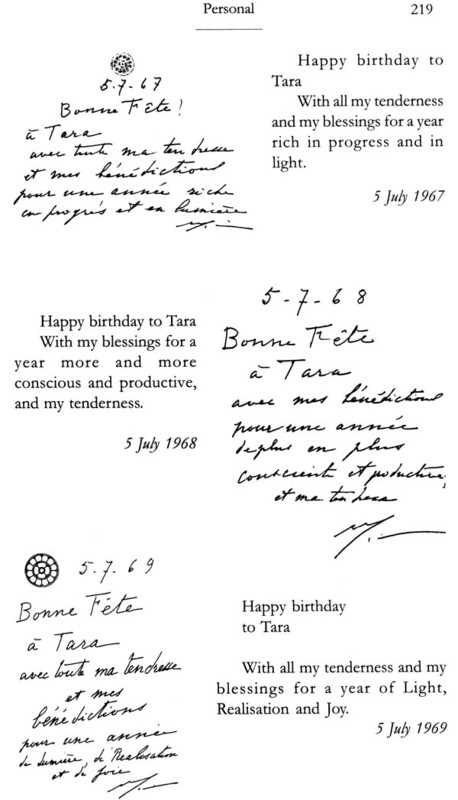 By explaining 'A God's Labour', by sketching two birds from two drops of ink that had fallen on a paper, by jotting down meditations ("Do not live to be happy, live to serve the Divine, and the happiness you enjoy will exceed all expectation") in the notebook which Tara carried around, by playing "The Magic Circle" or "Precious Stones" with the Ashram children. 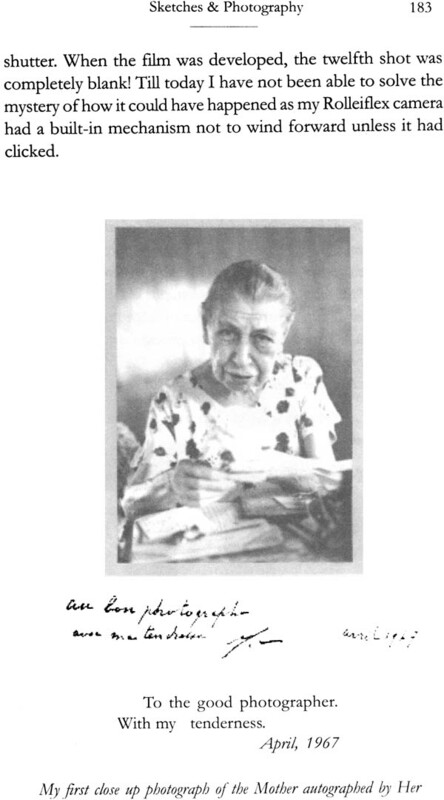 Growing Up with The Mother thus turns out to be the Book of Beginnings for aspirants in the world of Aurobindonian Yoga. We realise that it is also an Ananda yoga thanks to the visual presence of sweet Mother as the flames grow up in the Ashram and become lifetime achievers. The photographs in this volume are not mere results of man's technological advance; they are an armour against all fear, helplessness, depression. They make us hear the anabata nada the Mother recorded in Her Prayers and Meditations: ''And in my heart is the song of gladness of Thy sublime magnificence." 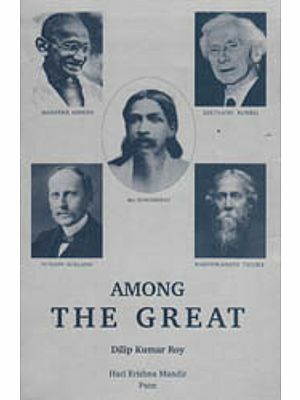 Sri Aurobindo has spoken of the Gita's ideal of Yoga as "skill in works". 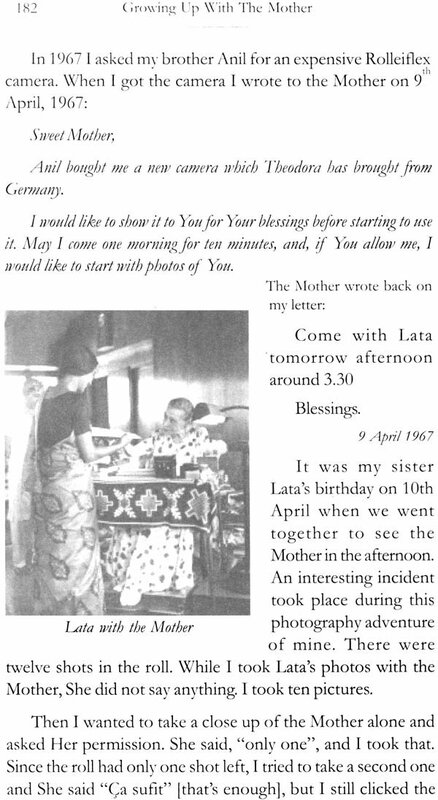 We find this yoga in the patient manner in which plans were laid to bring out a Book of Flowers and how the compassionate Mother agreed to record the significance on condition that She could "actually see the real flowers before writing the caption under the significance". There was so much enthusiastic activity that the Ashram gardeners began to grow rare flowers and even produced new flowers. The Rose of God, then, is no impossible dream. We shall certainly march behind our always-young Captain Tara Jauhar. Growing up with the Mother is an experience not easy to put into words. "Bliss it was in that dawn to be alive but to be young was very heaven." It is not often that a person gets the privilege of close proximity, guidance and love from the Divine incarnate in a human form and that too of a wonderful Mother. ''A Mother to our wants, a friend in our difficulties, a persistent and tranquil counsellor and mentor, chasing away with Her radiant smile the clouds of gloom and fretfulness and depression, reminding always of the ever present help, pointing to the eternal sunshine." My destiny took me to Pondicherry and engulfed me in Her Divine embrace at the tender age of eight. Since then there has been no looking back. The Mother has been my pole star and my guiding light and will ever be the "raison d'etre" of my existence. Over the years I received Her boundless love, affection, guidance and protection through personal contact and through letters and correspondence which helped me through my difficulties and failures and through the ups and downs of life, which I would now like to share with my friends and seekers on the path. 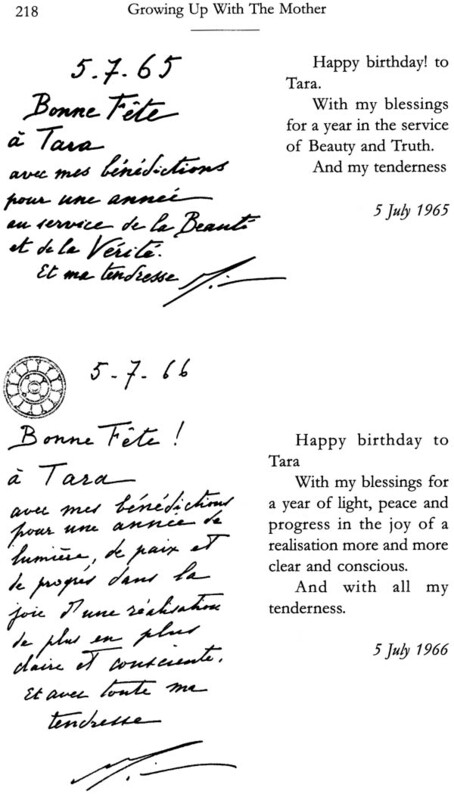 Most of these questions and answers, in the original French and English translations, have been printed in the Ashram Bulletins and have appeared in different volumes of the Collected Works of The Mother, but are being published here as a collection for the first time showing how the Mother patiently and persistently helped and guided a young girl towards the discovery of her inner being and held out Her ever helping hand, nurtured her growth, and led her on to the path of spirituality. This long overdue book contains my correspondence and conversations with the Mother between 1959 and 1973. It also has some personal letters and messages given by the Mother before 1959. What she wrote in my notebooks between 1950 and 1958 for the Group a (Green Group) classes of which I was the captain from the age of 10 1/2, however, has not been incorporated. I hope to bring these out as a separate book in the near future. My questions and answers of the Mother on Thoughts and Aphorisms are also not included here, since these have appeared as a separate book entitled On Thoughts and Aphorisms. While working with the Mother on the book Flowers and Their Messages in which the Mother gave a short commentary on each flower, I also asked many questions on flowers and vegetal life which did not find place in the final print of the book Flowers and Their Messages. Hence, these have been incorporated here as a separate chapter on flowers. But the innumerable questions and answers on clarifications of colours of flowers, significances, their translations into English etc., have not been included since it would not make interesting reading for everybody. I owe a deep debt of gratefulness to kindred souls, too numerous to acknowledge separately, who have helped me to collect, compile, correct, illustrate and prepare the material for this book. They have inspired me with words of encouragement throughout. For me they have been the instruments of the Mother's love. As we enter the new millennium which is the harbinger of a new light and force and life, I feel a deep joy in sharing this treasure of messages, correspondence and conversations, that give a wonderful insight and guidance to seekers on the spiritual path. 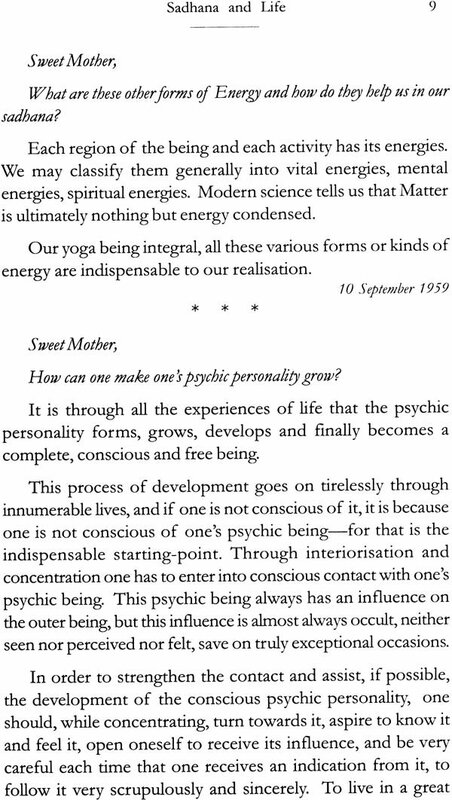 It also shows the natural unfolding of the Mother's relationship with a child of the Ashram and Her persistent guidance towards the flowering of a psychic being. Her encouragement, love and compassion were boundless and infinite. She has nourished my soul, my mind and my heart in the process of their growth. In deep gratitude I offer this work at her feet.